Hello there and welcome to another day of Clearly Besotted Teasers. Today I am sharing two sets with you - Mrs & Mrs and Flower Blocks. The first is Mrs & Mrs, it is a beautiful set with delicate designs along with sentiments in the most amazing font combination (I love it!). For my card, I first took a panel of white cardstock and stamped one of the images in the corner with Versamrk ink. I heat embossed it using WOW! Clear Matte Dull embossing powder. I then took an ink blender and Distress Inks in Tumbled Glass and Broken China and blended these on top. The sentiment is stamped beside it in black ink. The panel has been adhered to a black A2 card base with foam tape and I added a few DB Sprinkles to the image, to finish. My next card uses the new Flower Blocks set. I loved the touch of black on the last card so I decided to use that on this one too, this time combined with orange. I first took a panel of white cardstock and ran this through my Cuttlebug using the ME Femme Frames die. I took one of the flower blocks from the set and stamped this four times in a square shape using Soft Apricot ink. I stamped the sentiment (from the same set), on to a separate piece of cardstock in black and cut this out. This was adhered to the panel with foam tape. The whole panel was then adhered to an orange A2 card base with more foam. To finish, I added clear Wink of Stella to the stamped images and embellished with a few DB Sprinkles. Love these! Great cards, always so classy! These are lovely. 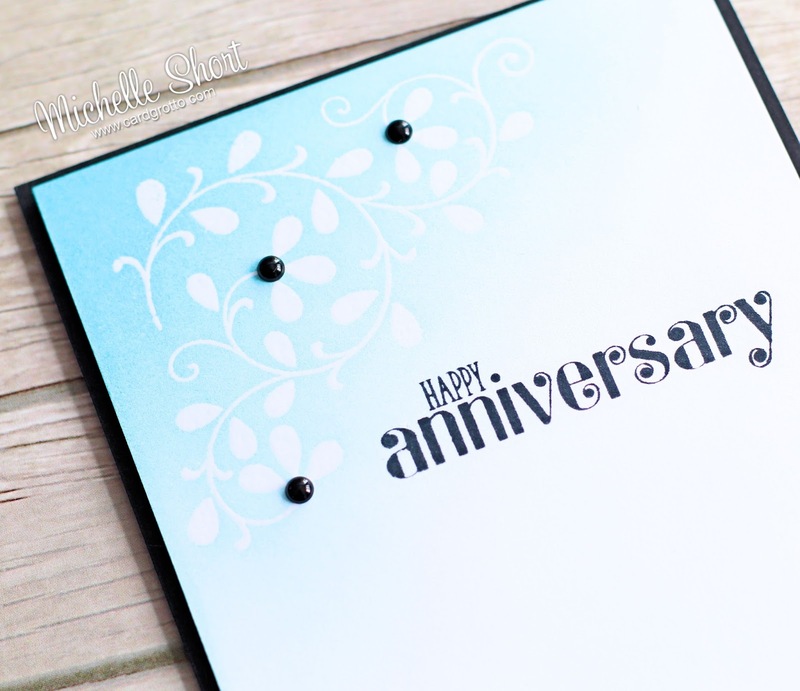 I especially like the Happy Anniversary card - very stylish. Can't wait til Thursday! Wow - I love your cards. The simple style is really great!!! Gorgeous CAS cards, Michelle! I especially love the embossing and inking on the first one! Will have to try out that embossing powder for sure!